*Correction pen contains multipurpose, ozone-safe correction fluid works on ballpoint, rollerball and felt tip marker ink, photocopies, computer printouts, typewritten documents and handwritten originals. *White fluid covers errors neatly and dries quickly to a silky-smooth finish. *Fine point metal tip is ideal for small print and detail work. *"Easy-squeeze" bellows-shaped barrel for effortless application. 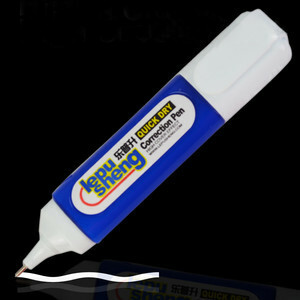 *Correction pen contains 12 ml.